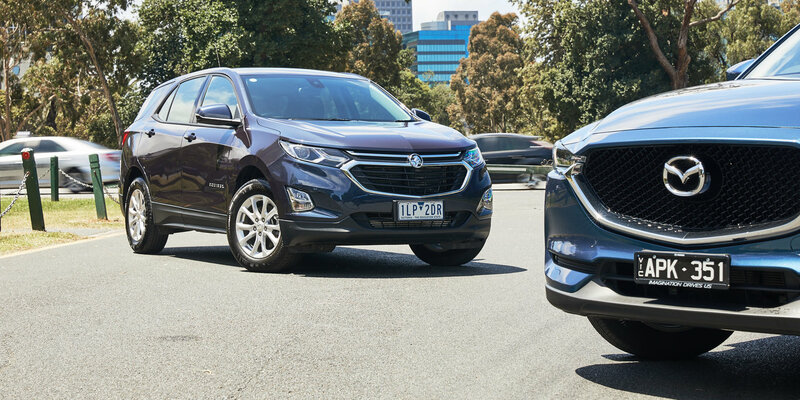 Holden thinks it finally has a convincing mid-sized SUV, addressing a major gap in its range. The model is called the Equinox, and the company calls it “Australia’s most user-friendly SUV”. 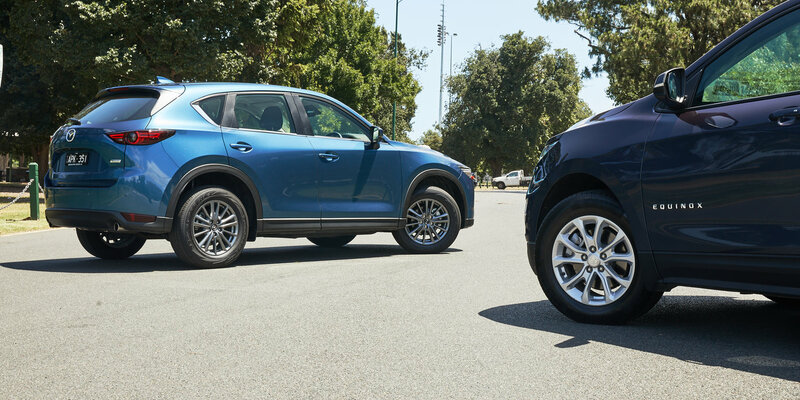 But if the now full-importer brand wants to make a splash in one of the market’s key segments, it’ll need to stack up against the top-seller – Mazda’s CX-5, itself relatively recently into its second generation. While it’s common for medium SUVs to kick off below $30,000 and climb to about $50,000 in their most luxurious guises, we’ve chosen a sweet spot of around $35K here, which is where a large number of buyers settle. Our challenger car is the Equinox LS+ priced at $32,990 before on-road costs, against the $1400 more expensive CX-5 Maxx Sport. Both are tested in front-wheel-drive (FWD) form, reflecting the fact that many users rarely leave bitumen. The good news is neither of these cars will make you feel like a pauper. Common features to both include 17-inch alloy wheels, good quality cloth seats, cruise control, auto headlights, push-button start, power-folding mirrors, Bluetooth/USB, 7.0-inch screens, six airbags and reversing cameras. Both also get a decent array of modern active and preventative safety features including city autonomous emergency braking (AEB), blind-spot monitoring lights in the mirror, and rear cross-traffic alert – a system that alerts you to perpendicular traffic when reversing. The Holden alone offers features such as Apple CarPlay and Android Auto smartphone integration, automatic high-beam lights, plus extra active safety tech including lane-keeping assist and a system to alert you of a potential forward collision before it happens. The Equinox also has the market’s only system that sends vibrations through the driver’s seat when the collision monitor goes off, a system that’ll terrify you at first but ends up being a useful extra warning. On the other hand, while the Mazda lacks any of this tech, it does alone have LED headlights, DAB+ digital radio, a BMW-style rotary knob to operate the infotainment located ahead of the console, USB inputs for rear occupants, and proper satellite-navigation that doesn’t require phone mirroring. It’s a hard pair to split, frankly, though the Holden being slightly cheaper – and let’s add, made by a company becoming known for being open to discounting – may get the edge. Although, the Mazda’s niceties make it feel distinctly more luxurious. The Holden’s cabin design is reminiscent of many GM products despite their disparate countries of origin (the Equinox is made in Mexico). The basics of ergonomic care are fine, with plenty of seat and wheel adjustability, and we really like the charcoal seats with a cool pattern and orange stitching. Add to this the high-mounted screen with basic friendly UX, plus ample storage options for bottles and other paraphernalia, and you have the early boxes ticked. On the other hand, the Mazda certainly has a higher grade of materials throughout its cabin, with more contrast surfaces, soft touch-points and an altogether more solid, upmarket presentation and feel. The CX-5’s tablet screen matched to its MZD Connect rotary dial is also better than Holden’s, since operating a touchscreen on a bumpy road can be a chore. The Holden’s back seats are excellent in terms of leg room and the adjustability on offer, while rear occupants also get ISOFIX anchors, air vents, LED reading lights and a 12V input. The seats flip-fold 60/40 and house a flip-down centre armrest with cupholders. The Mazda offers a smidgen less leg room, though anyone of regular height will be fine (this tester is 194cm). It also has superior head room/head clearance, rear vents, 40:20:40 folding seats allowing through-loading, ISOFIX, and a flip-down armrest with in-built storage and USB sockets for device charging. The Mazda’s middle seat is short in the base and high-mounted, though, making it largely useless for anyone but kids. Credit where it’s due to the Equinox, which offers excellent cargo capacity, expanding out to about 1800L with the back seats folded. The Mazda remains one of the less capacious offerings in the class, soundly beaten by the Honda CR-V, VW Tiguan and yes, the Holden. On the other hand, Mazda’s use of little levers in the rear to flip each back seat is clever, as is the detachable sliding soft cargo cover integrated with the tailgate. Both cars have space-saver spare wheels under the floor. While the CX-5 is not the final word in space utilisation, it’s not flawed enough to lose face to the Equinox, because it feels notably more expensive and premium inside, and remains highly flexible for young families. We’re also not convinced the Holden is any more practical than a Honda CR-V or Nissan X-Trail, despite Holden’s ambitious claims. It might be fightback time for Holden. To get both under the nominal $35K barrier (RRP), we grabbed the Mazda in FWD form, meaning it uses the smallest engine in its family – a 2.0-litre naturally aspirated unit making a modest 114kW of power and 200Nm of torque using 91 RON fuel. If you want the sprightlier 138kW/250Nm 2.5-litre unit, it only comes paired to an on-demand all-wheel-drive system and costs $3000 more ($37,390) than the model we’re testing. Meanwhile, the potent diesel/AWD drivetrain is $6000 more ($40,390) than our car. By comparison, the Holden uses a 1.5-litre petrol engine, which makes up for its small capacity by using turbocharging. As such it makes a superior 127kW of power and 275Nm of torque – 13kW/75Nm greater than the Mazda. Those with a real need for speed ought to know that the Equinox LT at $36,990 uses the most powerful engine in its class – a 188kW/353Nm turbo with a nine-speed auto and an AWD system that niftily decouples the rear axle on demand to save fuel. Additionally, a 1.6-litre diesel is coming as an option this year. The truth is, though, unless you want AWD or bragging rights, the Equinox’s 1.5 is a good little unit, with a typically broad slab of torque – pulling power – on tap from 2000rpm meaning rolling response is effortless even with a load, ergo refined. The six-speed auto gearbox has also been tuned well, with smooth and predictable shift patterns and none of the noise intrusion of the CVTs so in vogue on rival cars. To the Mazda. Just doddering around town, poking into gaps and accelerating easily in traffic is simple enough, and the lack of a turbo means response is instantaneous. Yet despite the exceedingly clever six-speed auto (with a sports mode option that holds lower gears for better initial response and aggressive downshifts) making its best efforts, you can’t ignore the fact that the modest peak power and torque hit late in the rev band, meaning you’ll be seeing engine speeds of 5000rpm regularly. This adds noise intrusion. Both companies claim combined-cycle fuel returns of 6.9L/100km. What’s interesting is we got 7.9L/100km in both cars on our loop, meaning the claims of parity are correct. Both are pretty frugal by class standards. Real misers or regular day-trippers might look at the diesels. Oddly, the Holden’s stop/start system that turns the engine off at standstill cannot be turned off unlike the Mazda’s. The good news is that it’s one of the most refined and least intrusive systems we’ve used from a field of hundreds – even the Germans should note. The Equinox may look like a boat, but extensive tuning done by Holden at its Victorian proving ground (still operational, and intended to remain so) means it suits local roads well. Commendations are due to the way the Holden’s suspension just eats up corrugations and other small inputs, while soaking up undulations without feeling unsettled. It’s very comfortable and, thanks to active noise cancelling in the cabin, quiet (17-inch wheels on high sidewall tyres help). At the same time, the well-weighted electric steering and the good body control from a well-sorted chassis mean the Holden actually feels quite responsive and comfortable/safe in a sequence of twisting turns. Mazda’s brand credo is ‘zoom zoom’, though nobody seriously demands a low-grade CX-5 to be sporty. This iteration is notably quieter than its predecessor, while its steering weighting is among the best in class. Also, we’d add that like the Holden, its 17-inch wheels with ample tyre sidewalls outside them give the Mazda a super-pliant ride, helped by suspension with plenty of travel damped well enough to settle the body down after undulations or cornering forces. It feels equally as agile as the Holden, and we have to say that alongside the Tiguan, Ford Escape and the Korean Hyundai Tucson and Kia Sportage twins, they set a high dynamic standard. The only grievances to the Mazda’s driving experience is the tendency for the front wheels to break traction on wet roads despite the low engine outputs (only to a minor degree, helped by a non-intrusive stability control system) and the lack of a digital speedo. When the Equinox launched, Holden was offering a special seven-year warranty. No longer. Its standard cover is a less spectacular three-years/100,000km, with free roadside assist 24/7 provided you use a Holden dealer for your servicing. Servicing intervals are 12 months or 12,000km, whichever comes first. Holden’s site shows current capped pricing per visit of: $259 for the first, then $299, $259 and $399. Mazda Australia’s warranty is also three years in term, though high-milers will be glad to see no distance cap. You have to pay an annual subscription of between $68 and $83 for roadside assistance through the company’s partner network. Mazda’s servicing intervals are set at every 10,000km travelled. The costs per visit are capped (excluding the usual incidentals, read the fine print) at $300, then $328, $300 and $328. The Holden Equinox is certainly a lot better than the Captiva, though merely to say that sells it short. It’s no looker, but the cabin is flexible, the safety tech is great, the pricing ditto, the engine is suitable and the locally tuned dynamics are above-average. However, the Mazda largely ticks these boxes as well, while being significantly more desirable on account of its more resolved design inside and out. It’s style as well as substance. By all means go look at the Holden, especially if space is your key priority – if it is, visit your local Honda and Nissan dealers too – but we’d opt for the carryover champion from Japan at this price point.